Hello 2013. Maybe this is the year you live your dream. A dream of wide open spaces and big skies, of fast-moving streams alive with trout, of snow-topped mountains filled with elk. Ranch country—and it’s all yours. Big country, big dreams. But it doesn’t have to remain in the realm of make-believe, thanks to an outfit like Fay Ranches. You can make it happen—with the help of these ranch real estate experts. We profiled Gregory Fay, partner in Fay Ranches, Inc. last month. Now, with their permission, we’re sharing tidbits from the Fay Ranches blog, just to whet your land-owning appetites. It helps us kick off a new feature for 2013: Ranch Real Estate. Buying a Montana fly fishing property for sale is a wise investment, and a decision that will give you and your family years of adventures and innumerable memories. The fly fishing in Montana is some of the best in the lower 48 states, and blue-ribbon trout streams and fisheries wind through the entire state. Montana’s Jefferson, Madison, Missouri, and Yellowstone Rivers are world-renowned for their fly fishing. Bozeman has an abundance of blue-ribbon trout streams within an hour’s drive, and neighboring Livingston also provides access to Paradise Valley and Yellowstone National Park. Fay Ranches is proud to represent the following five Montana fly fishing ranches for sale, which are some of the most famous and unique ranches in the West. Some feature custom-built ranch homes and structures, some are productive agricultural properties, but all of them feature private access to some of the most sought-after fly fishing in the United States. Circle B Ranch The Circle B Ranch features over three and a half miles incredible fly fishing waters, including 1.6 miles of frontage along Baker and V Creeks, and 1.5 miles of West Gallatin River Frontage. This 427+- acre property is a true sportsman’s paradise, with excellent whitetail, waterfowl, and pheasant hunting, a beautiful 5-bedroom luxury home, barn, guest quarters, machine shop, and the potential to expand the length of the fisheries on the ranch. 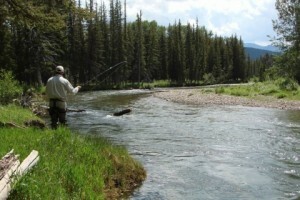 Read more about this Manhattan Montana fly fishing property for sale. Dome Mountain Ranch The Dome Mountain Ranch is an enormous Montana fly fishing property, featuring 5360+_ deeded acres, 470+_ State leased acres, and 508 acres leased from the BLM. One side of the ranch is bordered by over six miles of Yellowstone River frontage, providing world-famous wild trout fishing, and the rest of the ranch borders the Absaroka-Beartooth Wilderness and Yellowstone National Park. The ranch includes 3 lakes, a stunning log home, guest homes, barns, sheds, and a commercial lodge. The wildlife is abundant and diverse, and moose, elk, deer, mountain lion, antelope, waterfowl, and birds of prey are only a few of the animals that frequent the Dome Mountain Ranch. This property has been featured on several nationally televised programs and large publications, and it is rightfully one of the famous ranches in Southwest Montana. Learn more about the Dome Mountain fly fishing ranch for sale in Montana. Burnt Leather Ranch The Burnt Leather fly fishing ranch in McCleod Montana (pictured at top) is one of the most scenic fly fishing experiences in Montana, and also contains 2 miles of both sides of the West Boulder, a renowned and prolific fly fishery in the middle of the Greater Yellowstone ecosystem. The property includes the Steen Place Headquarters, is under Conservation Easement, and hosts an extraordinary array of wildlife, from deer to turkey to mountain lion. The Burnt Leather Ranch is a historic and iconic ranch, and is only 35 minutes from Livingston Montana. 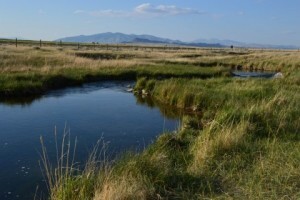 Learn more about the Burnt Leather fly fishing property for sale in Montana. McCoy Spring Creek Ranch The McCoy Spring Creek Ranch is a 1209-acre fly fishing property for sale near Dillon Montana, in the Beaverhead Valley. The ranch houses several ponds and wetlands that provide endless hours of fly fishing and waterfowl hunting, and both sides of a productive spring creek flow through the property. Several other blue-ribbon fisheries are nearby. In addition, McCoy Spring Creek Ranch has five circle pivots and produces grain, alfalfa, and corn. This ranch has an astounding amount of recreational value for a property of its size. Learn more about this Dillon Montana fly fishing ranch for sale. Oyler Ranch on the Gallatin River The Oyler Fly Fishing Property in Bozeman Montana straddles the West Gallatin River for approximately 2 miles, as well as two other spring creeks, providing immediate access to over three and a half miles of blue-ribbon fly fishing. The property is known for its excellent whitetail, pheasant, and waterfowl hunting, and it also includes around 90 acres of irrigated production ground. Only 15 minutes from a commercial airport and 30 minutes from the boutique shops, restaurants, and historic downtown of Bozeman, Montana, this world-class recreational ranch is an opportunity not to be missed. 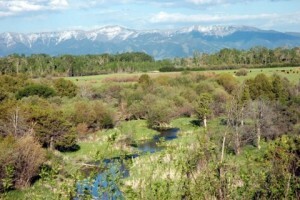 Read more about this Bozeman Montana fly fishing property for sale.